Transformer votre meuleuse en ponceuse. 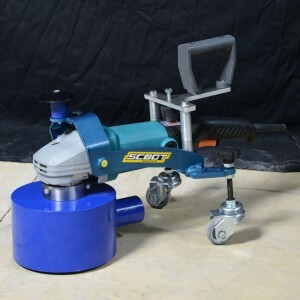 The Scoot is a simple tool that turns your standard angle grinder or polisher into an effective planer. Universal, it comes in three formats and fits most grinders. This unique tool will allow you to work without stress and effort! 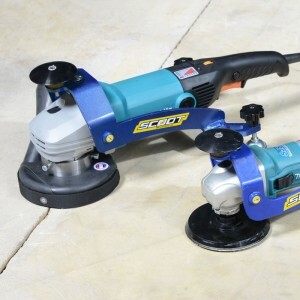 The Scoot mini is suitable for Ø125 mm variable speed grinders. The Scoot standard is suitable for Ø180 mm variable speed grinders. 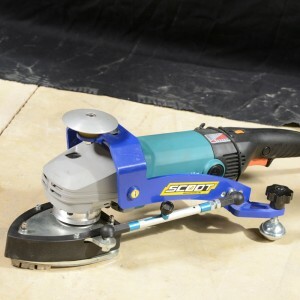 The Scoot max is suitable for Ø230 mm variable speed grinders. The Corner Scoot makes it possible to transform your variable speed grinder into an efficient corner grinder. Simply set a Scoot (standard size), screw the Corner Scoot onto the grinder instead of a cup grinding wheels and you’re ready to go! It is suitable for Ø180 mm variable speed grinders. The Bush hammering Scoot makes it possible to transform your variable speed grinder into a bush-hammering machine. All you have to do is set the system on the grinder, screw in the bush-hammer plate and you’re ready to go! It is suitable for Ø180 mm grinders. 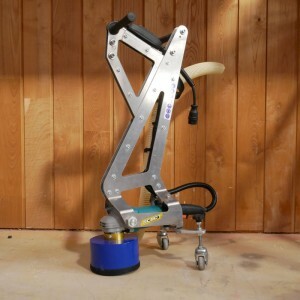 The Stand Up Scoot makes it possible to transform your variable speed grinder into a bush-hammering machine and thus to work standing upright without fatigue. All you have to do is install the system on the grinder, screw in the bush hammer plate and you’re ready to go!